Erth Canvas Multi-Tasking Concealer is an all natural mineral concealer with a soft neutral shade, great for light to medium skin tones. Provide superior coverage where foundation is just not enough. Comes in a 10 gram jar with 2 grams of product. 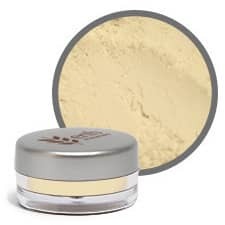 Mineral concealers help conceal, but also absorb excess oil. Non-irritating and non-comedogenic, so are perfect for those with sensitive skin. Concealers are an important part to any makeup routine, unless you are lucky enough to have naturally flawless skin. Yellow is the best color choice for most women as it helps to counteract most skin imperfections including mild acne and rosacea. It also works well for bluish bruises or under-eye circles. Mint green concealers are best for use on severe red blemishes, severe rosacea, and port-wine stains. Ebony skin does better with a golden and orange concealer combination. For deeper ebony skin, warm, brown concealer usually covers best. Begin by using a concealer brush and with one layer, adding layers to add coverage.